Presented to the Riverview Dharma Centre on Sunday, October 1, 2017. The bodhisattva Naksatrarajasamkusumitabhijna (‘One Whose Superknowledges have Been Beflowered by the Kings of the Constellations’) asks the Buddha to recount the history of Medicine King. Medicine King is an important Mahayana bodhisattva who first appears in Chapter X, to whom the Buddha reveals that all those who hear even a single verse or phrase of the Lotus Sutra will achieve supreme and perfect enlightenment in accordance with the Law of Karma. In response, the Buddha tells the story of the Tathagata Buddha Candrasuryavimalprabhasri (‘Pure and Bright Excellence of Sun and Moon’), who taught the Lotus Sutra to the bodhisattva Sarvasattvapriyadarsana (‘Seen with Joy by All Living Beings’). ‘Seen with Joy by All Living Beings’ attained the samadhi that ‘displays all manner of physical bodies,’ and made offerings to the Buddha, including the sacrifice of his own body. Because of this sacrifice, ‘Seen with Joy by All Living Beings’ was spontaneously reborn in the pure realm or Buddha field of ‘Pure and Bright Excellence of Sun and Moon’ in the house of King Vimaladatta (‘Pure Virtue’) seated in the cross-legged posture, whereupon he flew up approximately 210 meters (686 feet) into the presence of the Buddha ‘Pure and Bright Excellence of Sun and Moon’ seated on a “platform.” The Buddha tells ‘Pure and Bright Excellence of Sun and Moon’ that tonight the Buddha will experience his passing on. The Buddha entrusts the dharma to ‘Pure and Bright Excellence of Sun and Moon’, and directs him to build stupas for whatever relics remain, whereupon he passes on in the last watch of the night (approximately 2 or 3am to 6am, about the same time that Shakyamuni Buddha is supposed to have attained enlightenment). ‘Pure and Bright Excellence of Sun and Moon’ cremates the Buddha and, overcome by grief, he burns his forearms, which are miraculously restored by an Act of Truth. We are familiar with the Power of Truth from the Pali Canon, which the Lotus Sutra explains as an oath that is real and not vain. The Buddha tells ‘One Whose Superknowledges have Been Beflowered by the Kings of the Constellations’ that ‘Seen with Joy by All Living Beings’ was the bodhisattva now known to the assembly as Medicine King, who sacrificed his body, which surpasses all other offerings, to the dharma billions of times in past lives. Just as self-sacrifice is the supreme virtue, so is the Lotus Sutra the supreme and most profound sutra, like Mount Sumeru, the axis of the world; the sun; the moon; or the sage king, destroying all obscurities and imperfections. In particular, it is the sutra of the bodhisattva path, with the power to save all living beings. Like a clear, cool pond, it can slake the thirst of all. As a chilled person finds fire, as a naked person finds clothing, as a merchant finds a chief, as a child finds its mother, as a passenger finds a ship, as a sick person finds a physician, as darkness finds a torch, as a poor person finds a jewel, as the people find a king, as a commercial traveller finds the sea, as a candle dispels darkness, this scripture of the Dharma Blossom also, in the same way, can enable the beings to separate themselves from all woes, from all sickness and pain, and can loose all the bonds of birth and death. The merit of hearing, writing, or worshipping it is limitless. The same is said of the present chapter of the Lotus Sutra. A woman hearing this chapter of the Medicine King will never again be reborn in an inferior body. If she practises it, she will be reborn in the Western paradise called Sukhavati (lit. 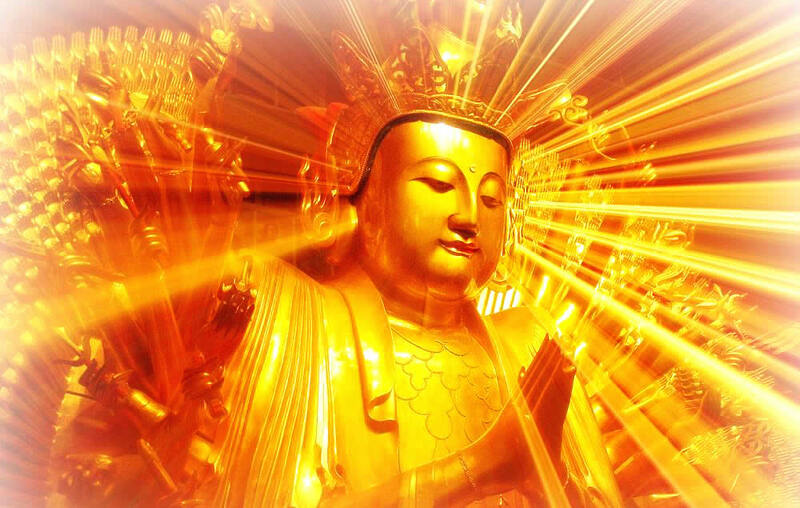 ‘full of joy, blissful’), the pure land of Amitabha, the Buddha of Immeasurable Life and Light. They will gain the supernatural insights of a bodhisattva, especially the understanding of the principle of unborn dharmas (Kato et al. have “will attain transcendent powers and the assurance of no rebirth”). This will be true of the final five-hundred-year period called the Decay of the Law, characterized by the demise of the True Dharma, strife, and division. According to the Mahasamnipata Sutra (circa 414 CE) this period will begin two thousand years after the Passing On, or 1600 CE according to the best modern reckoning, ending in 2100 CE. The 17th century corresponds to the Scientific Revolution, referred to in the Pali Canon as the sattantarakappa (“sword interval” or “age of science”), the General Crisis, and the intensification of the European conquest of the Americas that has led to the existential crisis of the 21st century. I have discussed this prophecy in my book, Conversations with the Buddha. A person hearing this chapter will attain the Divine Eye whereby they will see Buddhas, much as the great English bodhisattva William Blake saw infinity in the palm of his hand and eternity in an hour. The new age is the age of Set, Saturn, Satan, or science (sattha), i.e., natural religion, or rationalist deism, which delivers us from death through death. Swedenborg was of course born in 1688. Before we all go out and immolate ourselves, however, I would like to remind the reader of the essential hermeneutic of the Lotus Sutra that the verses of the Lotus Sutra conceal innumerable secret meanings (see Chap. XIX). That is to say, the Lotus Sutra is an esoteric sutra that is not to be understood literally. Similarly, Jesus advises his followers to cut off your hand or your foot or rip out your eye rather than to wind up in the unquenchable fire (Mark 9:43 ff., ASV; cf. Matt. 9:29 f.). There is a similar allusion to self-immolation somewhere in the Pali Canon, but like most sane people, I would not recommend interpreting this advice literally. The Pali Canon contains explicit warnings against committing suicide in the pursuit of salvation. The Buddha, of course, forbade the taking of life in the Five Precepts and in the Vinaya. Nevertheless, fanatics in both the Buddhist and Christian traditions have interpreted it literally, to their detriment. Gadgadasvara declares that he will go to the earth plane to worship Shakyamuni Buddha and visit the bodhisattvas there. ‘Knowledge Conferred by the King of Constellations named Pure Flower’ warns Gadgadasvara not to disparage the earth plane, though he admits that it is filthy, because even there perfect Buddhas and bodhisattvas may be found. By the power of his samadhi ‘Knowledge Conferred by the King of Constellations named Pure Flower’ causes a rain of lotus flowers to appear on Vulture Peak. Manjushri begs Shakyamuni Buddha to tell them what samadhi ‘Knowledge Conferred by the King of Constellations named Pure Flower’ has attained, so that they too might practise it and can see his marks. ‘Knowledge Conferred by the King of Constellations named Pure Flower’ travels through several realms in order to reach Vulture Peak along with his entourage of bodhisattvas in a tower-like aerial vehicle called “seven-jewelled terrace” and ascended to a height of 210 meters (686 feet). Descending from his aerial vehicle, he approaches the Buddha, presents him with a jeweled necklace (mala? ), and asks to see the body of Prabhutaratna, the dharmakaya of the Buddha in the aerial stupa from chapter XI. Padmasri (‘Floral Excellence’) wants to know how ‘Knowledge Conferred by the King of Constellations named Pure Flower’ developed these siddhis. Shakyamuni tells Padmasri that ‘Knowledge Conferred by the King of Constellations named Pure Flower’ performed many meritorious deeds over many lifetimes, in numerous different bodies and roles, including devas and humans, even including women, as well as worshipping the Buddha ‘King of the Sound of Thunder in the Clouds.’ He also teaches the Lotus Sutra. Indeed, he can assume whatever form is necessary to save beings. Finally, the Buddha tells Padmasri that ‘Knowledge Conferred by the King of Constellations named Pure Flower’ dwells in the samadhi called “manifestation of the body of all forms.” This samadhi is also associated with a dharani or mantra (which is not given). Gadgadasvara then returns to his own pure land and tells ‘Knowledge Conferred by the King of Constellations named Pure Flower’ everything that has occurred. The bodhisattva Aksayamati (‘Inexhaustible Mind’) rises and asks the Buddha why Avalokitesvara (lit. “the lord who looks down on the cries of the world”) is called “Observer of the Sounds of the World.” The Buddha declares that those who call upon the name of Avalokitesvara will gain deliverance from suffering, pain, and torment because of the great merit of the bodhisattva. Like the doctrine of the Tathagatagharba, this is another “secret doctrine” of the Lotus Sutra, in which Avalokitesvara is mentioned for the first time. Nevertheless, Avalokitesvara is also revered in Theravadin countries, where he is referred to as Natha-deva (Sri Lanka), Lokanat (Myanmar), and Lokesvara (Thailand). Although he is sometimes identified with the Future Buddha, Maitreya, this is erroneous. The Buddha’s hyperboles recall Jesus’ statement that those who have faith could move mountains, which is of course literally false, thus begging the question of what is actually meant. An interesting detail is the reference to ghosts, who apparently afflict others with an “evil eye” (Kato et al. have “wicked eyes”; Kern has “wicked designs”). As with Jesus’ pronouncement about faith, the sticking point in the Buddha’s statement is that one must have “single-minded concentration.” In previous talks, I have referred to the theory of the egregore, whereby the concentration of millions of prayers directed to a common symbolic focus results in an accumulation of merit (“psychic energy”) associated with that egregore that can be “tapped into” similarly to the principle of the Transfer of Merit. Thus, the Buddha says, “For this reason the beings should ever bear him in mind.” Avalokitesvara may also be seen as a symbolic representation of the compassion of all Buddhas, as Samantabhadra or Adi-Buddha is a symbolic representation of the universal quality of Buddhahood, and thus ultimately efficacious. From this perspective, the historicity of Avalokitesvara as a bodhisattva is moot. The Buddha says that Avalokitesvara will appear to suffering beings in whatever forms are necessary for their emancipation, whether a buddha, pratyekabuddha, disciple, king, elder, householder, official, brahman, male or female monastic or lay follower, woman, male or female child, deva, asura, any other human or nonhuman being, or nature spirit. Thus, he appears continuously throughout the world in innumerable forms, conveying the gift of fearlessness. The bodhisattva Medicine King rises and asks Shakyamuni Buddha how much happiness can be obtained because of receiving, keeping, reading, reciting, or copying the Lotus Sutra. The Buddha replies that anyone who reads, recites, understands, and practices as little as a single short verse of the Lotus Sutra will experience happiness greater than that of someone who makes an astronomical number of offerings to the buddhas. Medicine King then gives a mantra to the preachers of dharma for their protection. Hurvitz notes that most of these mantras use feminine singular vocative verb forms. Kern remarks: “I take these to be epithets of the Great Mother, Nature or Earth, differently called Aditi, Prajna, Maya, Bhavani, Durga.” They are largely untranslatable. Brave Donor, Vaisravana, Realm Holder, and ten demon (rakshasa) daughters also recite their own protective mantras for the benefit of the preachers of dharma. As a result, 68,000 thousand accept the doctrine of the unborn dharmas (“the assurance of no rebirth” according to Kato et al. ; Kern has “the law that has no origin”). Fine Adornments was a follower of Brahmanism, but his wife and their two sons were attracted to the teachings of the Buddha, and the sons sought to hear the Buddha preach the Lotus Sutra. Persuading their father by a magical display, strongly reminiscent of the UFO phenomenon, the sons seek their mother’s permission to become monastics in order to follow the Buddha, which she gives, because buddhas are as hard to find “as it would be for a one-eyed tortoise to encounter a hole in a floating piece of wood.” Whereupon the whole family, including a large retinue from the king’s palace, go to where the Buddha Wisdom Adorned with Flowers is. They scatter pearls over him, and experience a vision of the buddhas, luminous, made of subtle matter, seated on a couch on a terrace with four pillars. The Buddha in his turn predicts the future buddhahood of King Fine Adornment. The king confers his realm on his younger brother and he, his wife, sons, and retinue all become monastics. After a very long time of practising the Lotus Sutra the king attains the samadhi called “adornment of all pure merit” and ascends into empty space to a height of 210 meters (686 feet). The Buddha preaches the merits of spiritual friendship to the king. The king describes the Buddha in an interesting passage, including a reference to his eyes, which are long, broad, and blue. After praising the Buddha, the king departs. Now the Buddha addresses the assembly and informs them that the bodhisattva Floral Excellence is none other than King Fine Adornment. 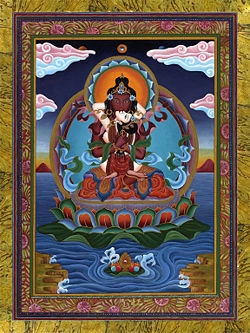 His wife the lady Pure Virtue is the bodhisattva Marks of Adornment. The sons are Medicine King and Above Medicine. They must “launch” the thought of rescuing all living beings (Kato at al. have “aspire after the salvation of all the living”). Formally, these four conditions appear to refer to taking refuge, cultivating virtue or ethics, meditation, and generating bodhicitta. Universally Worthy presents a practice in which one aspires to the Lotus Sutra continuously for 21 days, culminating in a vision of Universally Worthy, “mounted on my white elephant with six tusks.” Universally Worthy will teach him and give him a mantra, which he recites. Copying the sutra alone will result in rebirth in the dimension of the thirty-three gods of the Vedic pantheon, called Trayastrimsa, the highest heaven that maintains a physical connection with the rest of the world, at the peak of Mount Sumeru, at a height of 80,000 yojanas. The Lotus Sutra includes an interesting description of life in the Trayastrimsa heaven, including eighty-four thousand female musicians who entertain the inhabitants (cf. the “celestial maidens” of the Quran). This tradition of female nymphs inhabiting higher worlds is also found in the Pali Canon. They who read, recite, and interpret the Lotus Sutra will be reborn in the Tushita (‘satisfied’ or ‘pleased’) heaven, the residence of the Future Buddha, Maitreya, as well as Shakyamuni Buddha’s mother, Maya. Shakyamuni Buddha declares that those who receive, keep, read, recite, recall, cultivate, practise, and copy the Lotus Sutra have seen Shakyamuni Buddha himself and are “covered by his robe.” Such a one will be freed from passion, fondness for the “manuscripts of the external paths” (the implication being that the Lotus Sutra describes an “internal” or esoteric path), and wrongdoers. They will have the Power of Merit and attain complete and final emancipation. Those who mock them will be born blind. Those who criticize the Lotus Sutra will be reborn as lepers. Those who mock the Lotus Sutra itself will be reborn ugly, deformed, and diseased. This is of course the doctrine of karmic consequences. Upon the completion of this chapter the assembly of bodhisattvas all attain the mantra “that can be turned to a hundred thousand myriads of uses.” The assembly rejoices at the Buddha’s Word, they bow to him, and depart. The Sanskrit word is bodhimanda, “seat of wisdom.” Manda is the root of mandala, referring to a celestial orb. Cf. The Chaldean Oracles of Zoroaster: “The girders of the soul, which give her breathing, are easy to be unloosed” (Psel. 32 – Plet. 8). Threefold Lotus Sutra, p. 310. Kern has “he will also receive the five transcendent faculties, as well as the acquiescence in the eternal law” (Saddharma-Pundarika, p. 390). The major alternative date of 483 BCE would put the 2500th year of the Parinirvana circa 2017 CE. The traditional Theravadin date of 544 BCE, which would put the year 2500 BE circa 1956/57, corresponding to the Sixth Buddhist Council, is untenable. “To see a World in a Grain of Sand / And a Heaven in a Wild Flower / Hold Infinity in the palm of your hand / And Eternity in an hour.” “Auguries of Innocence,” in the Pickering Manuscript (1803). “With this pure mental faculty, by hearing so much as a single gatha or a single phrase, he shall penetrate incalculable, limitless meanings; and after having understood these meanings, he shall be able to expound a single phrase or a single gatha for as much as a month, or four months, or even for a year, and the dharmas that he preaches shall be in accord with the import of that meaning, standing in absolutely no contradiction to the marks of reality” (Hurvitz, Scripture of the Lotus Blossom of the Fine Dharma, p. 276). Cf. SN 56.48. Kato et at. identify this as chapter 15 of the Samyutta Nikaya (p. 335 n. 4).